Tring Athletic bowed out of The FA Vase just three steps from Wembley Stadium in front of a record crowd of 1,236 people at the impressive home of Melksham Town at the weekend. Athletic got off to a disappointing start in this last-16 tie on Saturday and found themselves behind after conceding two early goals, but they fought back gamely and at times played some entertaining football against a talented and difficult side. The Tring players looked deflated at the end but they should not be as they put everything into the game and can rightly be proud of their performance and in delivering this exciting and historic cup run. Beforehand, many were calling it the biggest game in Athletic’s history and hundreds of Athletic fans travelled to Wiltshire for this clash, against a side currently lying in third place in their respective league, The Toolstation Western Football League, which is considered comparable to Tring’s SSML Premier Division level. One fan, Geoff Gaut, spoke for many when he said: “They can be proud of their performance and what they have achieved on this historic occasion for the club. “I am sure all those supporters who travelled to the game feel the same. The superb Oakland Stadium was a fitting venue for this momentous game in Athletic’s history and despite rain falling for most of the morning the pitch was still in a excellent condition thanks to the Melksham ground staff. 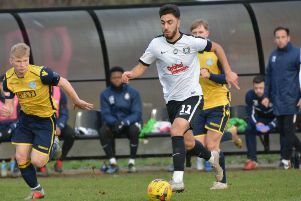 Tring Athletic bowed out of The FA Vase in front of a record crowd of 1,236 at Melksham Town in the last-16 of the vaunted national cup competition on Saturday. Athletic’s Tommy Twelves was out after pulling a muscle in training and Mark Riddick had to play despite being ill all week with a stomach bug. Athletic did welcome back Elliott Goward following injury. On eight minutes a long diagonal ball to the far post was powerfully headed towards Tring’s goal by Mike Perrott, and keeper Jack Hopwood made a terrific save but the loose ball hit the post and dropped over the line to open the score for the hosts. Athletic found it difficult to get into the game as Melksham hit long balls upfield at the earliest opportunity into Athletic’s area. A soft corner after 14 minutes led to the second Melksham goal. The cross went deep, was headed back across the box and with no defenders on the post, Rob Hobbs had the simple task of scoring. Athletic then started to get their passing game together, winning a couple of corners in quick succession and a free-kick saw Riddicks’ header go just over. With Athletic now seeing more of the ball and playing some neat passes, they were rewarded with the goal of the game. Luke Dunstan took possession of the ball in midfield and dribbled past several of the home side’s players before shooting past keeper Rob Brown in the 40th minute. The second-half began with Melksham’s leading scorer Gary Higdon shooting just wide and Athletic’s Dave O’Connor hitting the post with a header from a free-kick. Tring strove doggedly for an equaliser for the remainder of the half and did create some chances but couldn’t breach the Melksham goal. Tring: Jack Hopwood, Ben Johnson, Chris Mason (Colm Parrott 79), Mark Riddick, Dave O’Connor, Luke Dunstan, Max Hercules (George Carbery 74), Sam Joliffe (captain), Chris Vardy, JackRead, Elliott Goward (Jack Sunderland 74).